If children don’t learn to talk when they are young, it becomes difficult or impossible to teach them. Children raised in isolation either never learn to talk, or do so poorly. There is a critical period for learning speech. One can argue about the exact age, but the longer you wait, the more difficult it becomes. There may be critical periods for learning other things besides speech. For example, there may be a critical time for acquiring a conscience. I believe it is around the age of 8 or 9. But surely, if one has not developed a conscience as a teenager, one never will. Yes, ethics courses in business schools, law schools, and medical schools are useful. They point out pitfalls of those professions. But to a student who had not developed a conscience earlier, they merely teach how not to get caught. They merely produce a higher-functioning sociopath. We kick the Scouts and ROTC out of schools. Then where will kids find positive role models? We feed kids breakfast, lunch, and now supper at school. Then how will they learn that they, and not the government, are responsible for feeding their own children? How will they learn to be citizens of a constitutional republic, not subjects of Big Brother? Do you want to take over a country? Do you want to overthrow a civilization? You don’t need to subvert the army and stage a military coup. You don’t need to stir up a violent revolution. You don’t need to argue persuasively and convince people you’re right. No, that would require too much effort. That’s exactly what’s happening. Check out anti-American, anti-democratic, anti-Judeo-Christian lessons taught by our high schools and universities. Check out the same lessons being taught in more vivid form by Hollywood films. We wonder whether the Boston Marathon bombers were radicalized by some sleeper cell. This is a good question. But a better question is why we ourselves are influencing young people – native born and immigrant – to see our country in such a negative light. Some people can tolerate an amoral, chaotic mess. Some people can’t. If you doubt this, ask John Walker Lindh. He went to liberal schools. His mother dabbled with Buddhism. His father was a lapsed Catholic. When John was in high school, his dad left him and his mother and ran off with a gay boyfriend. Imagine the teasing John endured. His parents gave him no religious training but left him to “find his own way.” He did. He joined the Taliban, who – surprise! – want to kill Americans and gays. Adam Gadahn, for less clear reasons, joined Al Qaeda and became their spokesman. These people are the epitome of self-hatred. But how many other young people are equally alienated, and simply lack the motivation to join terrorist groups? How many other young people will grow sick of watered-down Christianity or Judaism, which have become merely liberal politics with music? If we don’t have a religious and moral revival, we can’t blame young people for seeking a source of guidance, even if it is anti-Christian, anti-Jewish, anti-democratic, and anti-American. We can only blame ourselves. This is a turning point in our history. Now we must make critical choices. We can’t avoid making them. If we do nothing, we are choosing to allow our civilization to be at least radically altered, and probably destroyed. It won’t happen at once. It may take another generation or two. The beautiful facade of Western – that is, Judeo-Christian – civilization will remain. But the structure will be eaten away internally, just as a house is weakened by termites. And one day, when no one expects it, the whole rotten thing will collapse on us. Our enemies, probably radical Islamists, will take over the property and rebuild it to their own specifications. And it won’t look anything like home. We were bequeathed this beautiful house by past generations, who worked hard to build it and fought hard to preserve it. And we are allowing it be destroyed piece by piece. If we let that happen, we won’t deserve to live in it anymore. 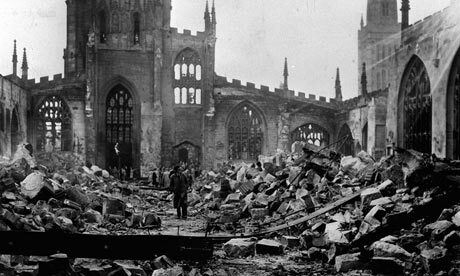 The photo at the start of this column is of Coventry Cathedral, which was destroyed by German bombs during World War II. The ruins remain as a reminder of man’s inhumanity. But at least it was destroyed by an external enemy in wartime. We are destroying the beautiful structure of our civilization, but we are doing it ourselves, a little at a time, from inside – so few people notice. But they will notice when the roof falls in, as it eventually will.